If you’re looking to work some extra vegetables into your diet this year, I have two words for you: vegetable purees. And no, I’m not suggesting you grab a spoon and dig into a jar of baby food. Vegetable purees can be used in all kinds of ways, from baking muffins to making pasta sauces. They’re pretty magical, much like unicorns and leprechauns, and they’re a great way to work those veggies into your day without feeling like you’re eating vegetables all day long. Take this creamy pasta sauce. It’s made with butternut squash and roasted red peppers — pureed with vegetable broth, they become a flavorful, nutritious sauce for tossing with your favorite pasta shape. Because I always like to add a vegetable or two to my pastas, I included some roasted cauliflower too, although you can omit that or use a different vegetable, like broccoli, if you prefer. That’s a lot of veggie goodness in one little bowl of pasta. 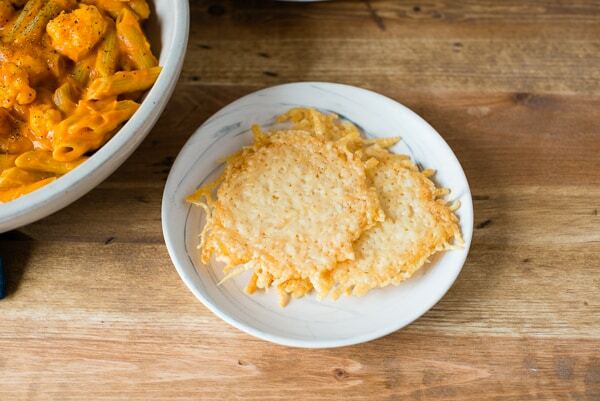 There’s a little something extra with this pasta recipe too — crispy parmesan circles! These are entirely optional, but they’re kind of fun, if your idea of fun involves baked cheese. It does involve baked cheese, right? You take shredded parmesan, form it into circles on a parchment-lined baking sheet, and bake them in the oven until they’re brown and crisp. (If you have non-stick cookware, you can also make them on the stovetop by putting the cheese directly in the pan and heating it up until it’s crispy.) If you’re one of those people who always claims the crispy edge pieces of lasagna (guilty! ), you will love these. This post was originally published on November 8, 2011. 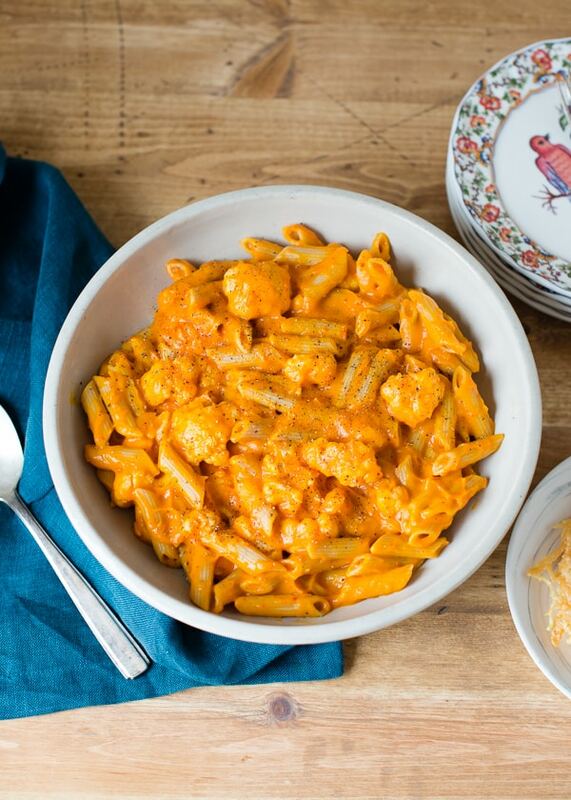 Roasted butternut squash and red bell pepper are pureed into a healthy, creamy pasta sauce. Spray two rimmed baking sheets with an oil mister (or line them with parchment paper). Put the cauliflower on one sheet and the squash and pepper on the other. Coat the vegetables with an oil mister or toss them with a drizzle of olive oil and sprinkle with salt and pepper. Roast the vegetables for 20 minutes, stir, and roast for an additional 20 minutes or until the they’re tender and just beginning to brown. Remove from the oven and cool slightly. 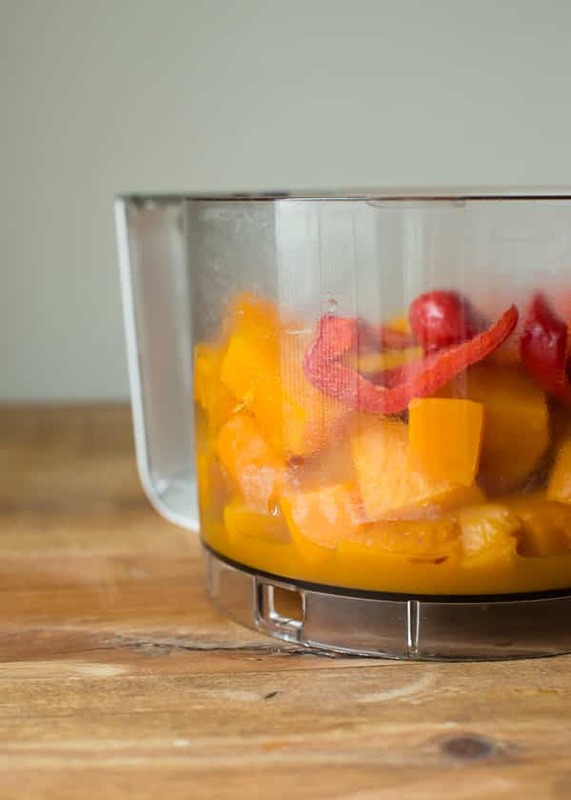 Put 1/2 cup of broth, squash and pepper pieces in a blender or food processor and process until smooth. If sauce is too thick, add the remaining broth. Season to taste with additional salt and pepper if desired. In a large bowl, combine the sauce, cooked penne, and cauliflower; toss to coat and divide into bowls. To make the Crispy Parmesan Circles, heat the oven to 425ºF and line a baking sheet with parchment paper. Divide the cheese into 4 large circles on the baking sheet — the individual cheese shreds should touch, but they shouldn’t overlap too much or they won’t get crispy. Bake for 10-15 minutes, until crispy and browned on the edges. YUM! I love butternut squash. Will definitely be making this in the near future. Going to ask the wife to make this. Looks so good. Have a ton of Butternut squash. My mom actually grew it! She grew hundreds of them and it wasn’t that hard. Now we’re eating it non-stop because it’s free. (don’t worry, I do all the grocery shopping and wife does the cooking and we are much happier with this arrangement.) Love the red pepper. The Olive Garden (dare I say that on a food blog) adds red pepper to a lot of their recipes and we kind of like it! This sounds really really good! Looks wonderful! I recently started trying whole wheat pasta again and am sold. I think a few years ago when I cooked it the whole wheat was just to al dente for our tastes. Now I’ve tried penne and spaghetti and love it! The crispy cheese addition is beautiful! You know, a lot of people really dislike whole wheat pasta, but I’ve always liked it. I like the heartier texture. I do think they’ve perfected the process in how they make it, though, and it’s definitely more like regular pasta now. This looks so good! So far I’ve only had butternut squash mashed – yay for variety! I don’t think I’ve ever had it mashed? I should try that! I’ve never had butternut squash before. Sounds yummy. Just heading to the kitchen to make this for dinner & saw there’s no temp for roasting the veg. Did I miss something? Can you plz update it? Sounds wonderful & a clever way to sneak some veggies into my kids’ diet! Sorry about that! I just updated the recipe–it’s 400ºF. We had to copy and paste all of our recipes into new formatting a few years ago and that must have gotten cut off! Thanks so much for such a quick reply! What a great idea!! Looks delicious! What an easy delicious sauce! I lovee butternut sauces, and I love how simple this one is! Looks like such an easy solution for fitting in more veggies. yummy! I think butternut squash is kind of mild tasting, so it should be a nice addition with the bell pepper! Thanks for the recipe. It did look wonderful but I found that it really lacked flavor. It was quite time consuming and not really worth the amount of work. Sorry. I’m sorry to hear you didn’t enjoy it–not every recipe is a hit with every reader! Yes!! And if you have houseguests, the smell of the roasting red peppers will have them salivating for your meal! I always roast several at one time (cut in quarters), put in a paper bag to “sweat”, then peel and use in other dishes over the following days. The smell is heavenly, the color and taste awesome! Made this lady night and it was a big hit! For extra flavor I roasted the squash with some dried thyme. Instead of roasting the pepper I used 3 large sweet roasted peppers from a jar (imported). So much flavor and a nice alternative to the other sauces in my rotation. Delish! Thanks for the great idea! !